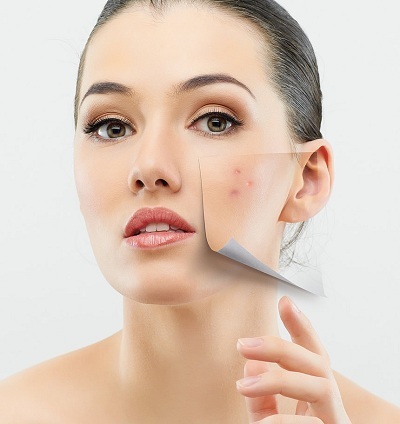 Acne is a condition that is triggered by a many factors from diet, stress, inadequate skin care routine and makeup. Excess oil production is the catalyst for acne breakouts, the cause of enlarged pores and follicle congestion. Testosterone in both women and men is released into the body and enters the sebaceous gland where an enzyme 5-alpha reductase converts the testosterone into di-hydrotestosterone; this then increases the oil formation in the sebaceous glands. In acne patients, abnormal cell overgrowth occurs in conjunction with excess sebum in the pores leading to the attraction of bacteria (Propionibacterium acnes) and the formation comedones (blackheads/whiteheads). Much of the inflammation that eventually occurs arises from the action of enzymes produced by the bacteria, stimulating white blood cells (immune-fighting cells) to help repair the damaged tissue. Continuation of severe inflammation leads to the formation of nodules and subsequent cysts (a.k.a. red ugly pimples), visible on the skin. Sugar and highly refined carbohydrate foods all drive up insulin and cause pimples. High levels of insulin can make your skin drier, flakier and thicker contributing to clogged pores. High insulin levels can increase free androgens (testosterone, produced by men and women alike) which can increase the activity of sebaceous glands, producing more oil and more acne. Opt for Stevia or Xylitol as a natural sweetener and avoid highly processed foods. Although milk is a great source of Calcium and other nutrients, it also contains natural hormones that are passed into milk. This may not be an issue for most people; however for acne sufferers the androgens (e.g. testosterone) and insulin like growth factor 1 that milk contains, will promote acne by increasing sebum production, increasing pore size and inflammation. Research from America shows that skim milk can be more troublesome for acne-prone skin than the whole milk because the fat content in whole milk allows it to be slowly digested which helps control the release of blood glucose and insulin in the body. Try soy, almond or rice milk as an alternative to cow’s milk to help avoid insulin growth factors and androgens in milk. In a study conducted by the Department of Dermatology at the State University of New York; 76 patients were treated for moderate inflammatory acne following twice daily use with Niacinimide for 8 weeks, after 8 weeks - 82% of the patients treated with Niacinimide showed improvement in acne. Try Youthphoria Revitex cream twice daily to reap the benefits of Niacinimide! This cutting-edge formula will help control blemishes because it contains active Niacinimide (Vitamin B3). The Revitex cream also contains the exclusive Monk’s Pepper berry to rejuvenate the skin, potent antioxidants and moisturising factors to help protect hydrate, heal and firm the skin! Your answer to flawless and blemish-free skin! Niacinimide is a fantastic proven alternative to other acne treatments such as benzoyl peroxide and triclosan which are drying and very harsh on the skin. Eat more colourful vegetable and fruits containing high quantities of antioxidants and anti-inflammatory compounds to reduce acne. Include fish oil, turmeric, ginger, green tea, nuts, dark purple and red foods such as berries and green foods like dark green leafy vegetables. Drinking plenty of water supports kidney function and helps your body remove toxins. Cleanse your face morning and night to remove makeup, sweat, oil and dirt that build up on the skin and pores which can aggravate acne and result in blackheads. The Youthphoria nutrient facial cleansing gel will clean and reduce the sebum build up helping with blemishes without causing dryness or that “tight skin” feeling. The Green Tea and Witch hazel in the cleansing gel will help settle inflammation and Pro-Vitamin B5 will help heal and soften the skin. Reports suggest epigallocatechin-3-gallate (EGCG) polyphenol from green tea may also influence hormonal aspects of acne since it is known to possess 5-α-reductase inhibiting properties when applied topically. One study in over 1000 teenagers from North Carolina found that each of the primary signs of acne – comedones, papules, pustules, acne cysts and oily skin – were significantly lower in those consuming the greatest amounts of fish and seafood, containing Omega-3’s. Omega-3s and Omega-6 from borage oil have been shown to control the production of leukotriene B4, a molecule that can increase sebum and cause inflammatory acne. To reap the benefits of the complexion-perfecting nutrient, pop a daily omega-3 and 6 supplements, or add foods like walnuts, avocados, flaxseed oil, and salmon into your diet. Hyper-active oil glands can lead to blemishes, but so can under-performing oil glands. Dry skin has tiny cracks in which bacteria grow, plus excessive flaking can contribute to clogged pores. By gently exfoliating the skin a few times a week with a scrub designed for the face containing a gentle and effective AHA acid like Lactic acid can help lead to a smoother complexion. Try Youthphoria’s AHA exfoliating face scrub super charged with blemish banisher, green tea and lactic acid. The increased blood flow to the skin cells help supply oxygen, nutrients and remove toxins and waste products such as free radicals and cellular debris. Don’t forget to layer the Revitex Youth Regenerating Moisturiser under broad-spectrum SPF 30+ sunscreen, if exercising outdoors to prevent pre-mature ageing, free radical and UV damage to the skin! Bike Riding is a great form of exercise. It’s fun and you can burn 183 calories in 30 minutes of light riding!